Have you ever wondered who really wins sweepstakes? Many people don't enter sweepstakes because they believe that no one ever wins or the chances of becoming a winner are too long. So here is a collection of photographs of real winners and their prizes, sent in by readers of this page. In this prize photo album, you can see real people posing with their sweepstakes prizes, big and small. When you see the winners with their prizes, you can imagine how thrilling it must have been to win. Use that as motivation to start entering to win great prizes today. Alexander Clark, used with permission. Ever dreamed of winning an iPad? Alexander Clark did, and he made that dream come true by entering a giveaway. 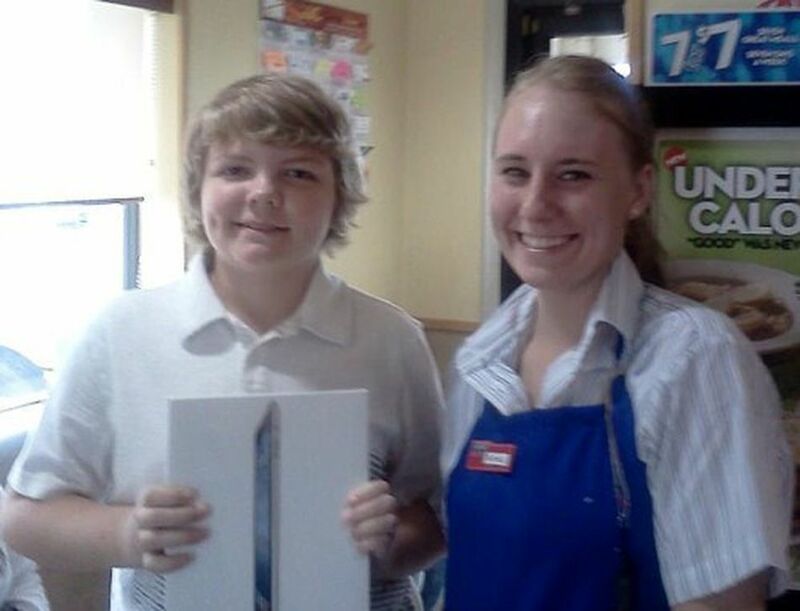 13-year-old Alexander Clark won an iPad from IHOP for entering a contest on Facebook. IHOP challenged Facebook fans to describe their ideal IHOP Day. "I was browsing the internet when I found out that IHOP Florida was holding a contest on Facebook and the prize was an iPad. I liked their Facebook page and submitted my idea of an IHOP day. At the end of the month, IHOP informed me that I won their contest and to email them. I was very excited, especially since I'm 13 years old. After getting everything situated, I headed down to my local IHOP and claimed my prize. After eating a delicious meal with my family, I left full of happiness with my new iPad!" Want to enter writing contests yourself? Get some tips here: How to Enter and Win Writing Contests. Image © Landis Communications, Inc., used with permission. Tracey Barnes wins the $10,000 grand prize in Cartridge World's Go Green, Win Green Sweepstakes. This giveaway celebrated Earth Day by asking entrants to share stories about how they make their homes and offices more environmentally friendly. The winner was chosen at random. Tracey Barnes' entry was drawn from among 11,533 submissions as the grand-prize winner. Her green tip? "My husband and I take bags along with us when we ride our bikes together,” said Barnes in her contest entry. “We pick up aluminum cans everywhere we find them and take them to a local recycling center nearby. We also take plastic grocery bags back to the store to place them in the recycling box. We are planning to get a recycled cell phone soon instead of a brand new one. We also compost and we recycle our printer cartridges at Cartridge World!" Cartridge World ran the contest to promote the company's green focus on refillable printer cartridges. If you'd like a chance to win a prize like this one, check out the current cash sweepstakes to enter. Here's a pic of me with the MacBook Pro I won through Big Prize Giveaways on Facebook. Its the largest prize I've ever won, and I'm particularly thrilled with it because we've had to cut back spending severely due to my husband being laid off continuously for almost a year now. I took up sweeping in December. It's a great hobby for me since medical issues keep me at home most of the time and I run an online crafting business from here as well. If you'd like to try to win a similar prize, check out the Computer and Laptop Sweepstakes list. Image © Philips Norelco, Used with Permission. Norelco Philips' Ultimate Football Sweepstakes challenged entrants to answer football-themed trivia questions every week. People who answered all of the questions correctly were entered into a drawing to be one of the finalists. At the end of the giveaway, eight finalists were randomly selected to compete in three tough rounds of NFL trivia conducted by Coach Mike Ditka and ESPN sports radio host Mike Greenberg. At the end of all three rounds, the last man standing was Boulder, Colorado resident John Friedberg. In this picture, you can see Friedberg accepting his prize at ESPN Zone in New York City. Aside from the trophy in the photo, John Friedberg also received a trip to Miami, Florida to have the "Ultimate Football Weekend" including tickets to the ESPN NEXT Party and $1,000 spending cash. The grand prize was worth $10,000, in addition to John's trip to New York City for the finals. If you'd like to win some football prizes, check out the Football and Super Bowl Sweepstakes list. Kimberly Green, an emergency room nurse from Dalton, GA, had her dreams come true when she won Century 21's The Path to Your Dreams ​​Sweepstakes. The grand prize was a check for $221,000 to be used toward the home of her dreams. A Century 21 agent will help her through the process of locating and purchasing her dream home for her family. This photograph shows Kimberly Green and her family accepting their prize check at a ceremony held at Grand Central Station in New York City. R&B singer Ashanti also performed a song from the Broadway hit musical, The Wiz at the event, and is pictured in the blue dress next to the winners. Hoping to win a life-changing prize? The Mega Sweepstakes list is a good place to start. This is to give hope to those that have not won. I had some very difficult months with depression and other permanent health issues. I purchased a book and CD collection from Dr. Wayne Dyer called Change Your Thoughts Change Your Life. As soon as I started reading it and changing my thoughts, everything in my life started turning around. A few days later, I received an email. I started entering sweepstakes that day and it was 1 or 2 days later I won a loaf of bread and I was hooked. After a couple of months of small instant wins, I finally won my first cash win - $100 from MyCoke Rewards. Then I won a grand prize race package of $11,800, but sadly I had to decline it due to health reasons. After that, I was in a slump for one and a half months. Then October brought me a Flip Video Camera from Pepsi. From November through May, I won actual cash/gift card/free food coupons totaling around $900, not counting other small instant wins and many t-shirt and hat wins. I just want everyone to know if you stay positive, your wins will come. If you'd like to try your luck, enter these current instant sweepstakes. Image © Garry M., used with permission. "We each won our separate prizes and then received them all in January! I started sweeping the end of last year (thanks to your site) and brought the rest of the family onboard. As you see, we have been quite lucky in the instant wins with your help! I am keeping a win album like you suggested and we are having a blast! And keep up the great work - we appreciate it!" Even kids can win fun prizes from giveaways. This photograph is of Kim's daughter, Grace M., and her fourth-place prize from Campbell's The Tale of Despereaux Royal Spoon Instant Win Game. The prize was 2 Movie Cash Plus Certificates worth $14 total. If you have kids who love to win, check out the Kids' Sweepstakes list. "I have always loved Ocean Spray products and coming up with a delicious recipe containing them was a labor of love. In the final cook-off, my recipe was up against three really great ones, and I felt that any of us could have taken the grand prize. When my recipe was named as the winner, I was both thrilled and honored that the three talented and respected food professionals who served as judges had chosen my recipe as the best of the best. Seven months after the contest, I'm still pinching myself. Being a wife and a mother, I am usually the one cheering for everyone else. Having them cheer for me is something I could get used to." "It took months to win even my first instant, but I had encouragement from my sweeps friend at work. Then all of a sudden I seemed to be getting an instant win every few days. I thought it might encourage others on the Forum if I posted some photos and screen captures of them. How did I feel? Like all the hard work was beginning to pay off, in at least a small way. Like trying to keep a big secret, I had to tell someone. That's why I post photos and such. I am saying look at me. I might not be rich, but I just got something for nothing. I've got a hobby that's totally fun, and somebody wants to give me something for free for doing it. Ain't it cool? I heard a quote once that sounds something like my life: 'If I cannot do great things, I can do small things in a great way.'" "The most I'd ever won before this was a $50 gift card. I feel so fortunate to be able to live rent-free, pay off my student loans and still have money left over to put money down on a car. Winning the 'What's Your FQ?' Sweepstakes has given me a head start on my life—and all without going into debt!" Ryanne sent in a photo of herself on a trip to a NASCAR race in San Francisco, California that she won from Reunite. Ryanne wrote a post on a sweepstakes forum, asking what she was doing wrong. She was frustrated because she had been entering sweepstakes for quite some time without results. She was thinking of giving up. With the encouragement she received on the forum, she continued to enter, and was really glad she did, when just a short time later she won exactly the prize she was hoping for: a vacation. Ryanne received a trip to her choice of NASCAR races, and she picked a race in San Francisco. Since then, she has also won a number of other prizes. Do you love car racing, too? Enter to win a trip of your own from these NASCAR sweepstakes. Mark DelMedico's photo shows that it doesn't take a huge prize to make a happy sweeper! Celebrating small wins helps keep sweepers motivated until bigger prizes roll around. "This is amazing. I have used Purex for years because it is a great value and works wonders on stains but we never expected to win this contest. We are blown away!" If a car prize is on your wish list, check out this list of current Car and Vehicle Sweepstakes to Enter. "I won a KITCHEN AID blender from bakespace.com. PURE LOVE, since I ADORE AND LOVE Kitchen Aid products. It was interesting that I even won it, I was in pure shock! I had never won an online contest before. It was my husband who had found Bakespace.com for me, in the first place. I had signed up and told a few friends about it. Next thing I knew I won! What was more special to me in the owner Babette. I currently live overseas due to my husband's employment as a military contractor. I did not have a "USA address," I had a military APO address. Since Kitchen Aid does not ship to APO and the prizes were being shipped directly from Kitchen Aid, Babette had my blender sent to her personal address and then sent me my prize. TALK about feeling pretty dang special. It made my first winning experience even better!" Image © Michelle, aka Georgia Mommy. A hiking trip with seniors appeared to be more sightseeing. We weren’t looking for any dangerous thrills. A day to enjoy each other and spend time in the sun. What started as fun soon gave us all reason to shout. But near the top of the mountain the leader did the trail disembark. Not on a trail and with no room to pass. The perfect spot I thought but it turned out to be the worse. We were hiking it turns out during a rattlesnake convention. Because a coiled and rattling snake lay just underneath. I screamed like a good girl and turned directly around. The seniors behind me that were once hardy now seemed frail. It seems he didn’t believe me that a snake I did find. We took a look around and saw several snakes their heads now rearing. We headed down the mountain with me now the leader. Back down to the trailhead to calm and reserve. Submitted to Swiss Army for your reading pleasure. So to you this clever rhyming essay I do send. "I got a call from Wise snacks marketing people. I had won the chance to go on the field for batting practice before the RedSox game on Friday night, meet Dave Madden (the batting coach) and another Red Sox player, and watch the game from seats on the Green Monster!!!!!!!! I get to take a guest, of course, my hubby who is a real big RedSox fan! The picture is of us sitting in the dugout at Fenway. It was taken with our camera by the Wise people. They were concerned that David Ortiz was late in arriving (it was the day that Manny was traded and Jason Bay was arriving and things were really crazy around Fenway, a really exciting time to be there!) We really enjoyed just sitting in the dugout or walking around the edge of the field watching them prepare for the game that evening. Being on the field longer than we ordinarily would have made it even more exciting. We are wearing the hats they gave us." Image courtesy of Kimberly Clark and Cottonelle. Mindy and Rich Lipman won a luxury retreat from Cottonelle's Be Kind to Your Behind Sweepstakes. The prize included three nights in a luxury resort within the continental United States, airfare, ground transportation, gift baskets, and $5,000 spending cash. The prize was worth over $15,000. In the picture, Mindy and Rich are posing with actress Judy Greer at the Cottonelle Ultimate Comfort Retreat at the St. Regis Monarch Beach Hotel in California. Hopefully, seeing all of these winners will motivate you to try your own hand at entering sweepstakes. Lots of prizes, big and small, are waiting for you!